Other: Private Bungalow. Pool. Pets welcome. Imagine two adjacent traditional French houses, a garden with a large swimming pool and on the side, a student’s bungalow. Conveniently located near Paris, between the towns of Chantilly and Beauvais, French teacher Chantal will welcome you – alone or with your family or friends, there is plenty of room – and tailor a French immersion program to match your specific needs and goals. Improve your French, relax in the pool and visit Paris in the afternoon! Bonjour, my name is Chantal. Welcome to my home! I am a French native, and I’m also fluent in English and Dutch. I have worked as a teacher for the Alliance Française and the Volks University of Nijmegen (Netherlands), and I have a DAEFLE degree (diploma for teaching French as a Second Language). Now that my adult children no longer live with me, I love having guests and exchanging cultural views and opinions. Although my house may look quite classic, I am very warm and easy-going and you’ll feel welcomed and at ease in my company. I live in a gorgeous family residence in Picardie near Paris. I have actually three adjacent houses! I had a bungalow built next to the pool especially for my immersion students: it’s a large room with a king size bed and a private bathroom, with a small kitchen. The bungalow is very private, full of light, comfortable and spacious : I’m sure you’ll love it! My house also has two extra bedrooms for people traveling with their family. If you wanted, you could also rent my whole house and I would move to the bungalow: I don’t mind at all, I do it all the time and it’s right next door. There is an enclosed yard with a patio and a large swimming pool (which you will certainly enjoy during the summer months – the student bungalow is just there, by the pool). There is a king size bed, two comfy leather chairs, a TV and wifi. The kitchen area is small but functional – anyway, I do most of the cooking in the big house! But it’s nice for students to have a small kitchen for snacks and coffee (notice the Nespresso machine!). 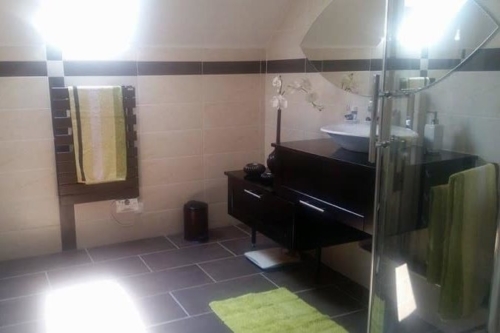 In the bathroom, there is a large shower, a sink and a toilet. Now, if you prefer or if you are traveling with your family, you could also have a room in my own house. My house has 3 bedrooms, one open kitchen and dining room area, a living room and one large bathroom. As you can see in the pictures, I have a very friendly labrador who loves company and a cocker spaniel. My pets are very friendly to adults and kids alike, and are part of my family. I don’t smoke, I love to cook and cook both traditional and gastronomic food. I will be happy to adapt my cooking to your specific diet, and share my family recipes with you – you are welcome to join me in the kitchen (a good way to practice your French). As you understand, there is plenty of space: with the two adjacent houses and the student’s bungalow, we can all hang out, as you enjoy the privacy of your own house at the same time. I live in a small town called Mouy, with many shops and restaurants nearby. I am a five-minute walk from the train station which goes to Paris in less than 40 minutes – We’ll visit Paris together if you’d like, and we’ll speak French as we do! 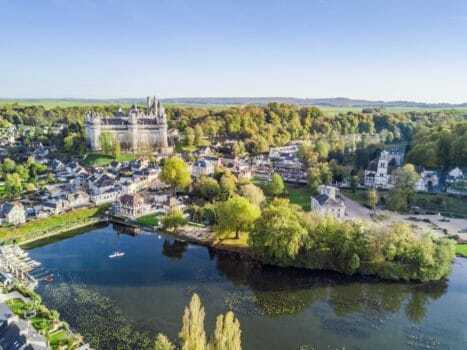 My house is very close to the gorgeous Chantilly castle and park, Pierrefond castle, the towns of Beauvais, Senlis… even Versailles is not far! As you see, there is really something for everyone in our region! What About An Immersion Stay With Chantal’s Daughter Eliane? Eliane and her boyfriend Benjamin live in the Somme region, about 50 minutes North of Chantal’s. It’s a region rich in many ways, especially for its WW1 history, castles, gorgeous and authentic villages. Eliane is French and speaks English fluently: well traveled, she very much enjoys showing students around and gently encourages them to speak with warmth and kindness. 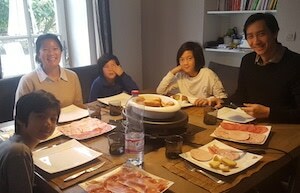 You will find more about Eliane’s French immersion homestay on this page. My house is at a five-minute walk from the train station which goes to Paris in less than 40 minutes. With plenty of public transportation, restaurants and shops in Mouy, you don’t need to rent a car, although I suggest you do if you want to be more independent and visit all this beautiful region has to offer. I don’t smoke and smoking is not allowed inside the house. You may smoke in the garden should you wish to. You are welcome to come with your pet as far as s/he is very friendly, quiet and will get along nicely with my two dogs. 3h x 5 days of private lessons – but that is only the formal part of the instruction. I spend as much time as possible with my students, and really share my everyday life with you, so you’ll get a lot of French practice. Your own bungalow located next to our house : a spacious room and a nice bathroom, small kitchen. Breakfast and lunch with me (unless you’d like to be more independent, it’s up to you). It’s a large “French style” lunch with plenty to eat. 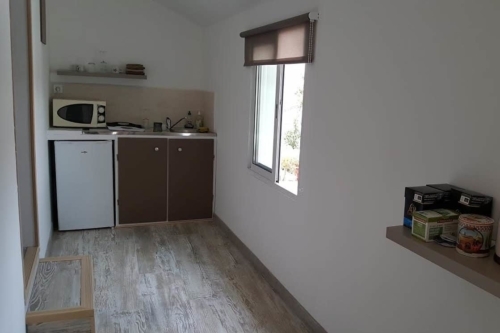 You’ll have dinner on your own: you are welcome to use my kitchen (and dig in the left-overs: there is always plenty of food at my house) and there are also many restaurants in Mouy within walking distance from our house. Pickup and Drop off to your Paris airport. For this program, the fee for one person is 1400 Euros per week from September to March, 1500 Euros per week from April to August. I can organise French lessons for everybody or just for one person. 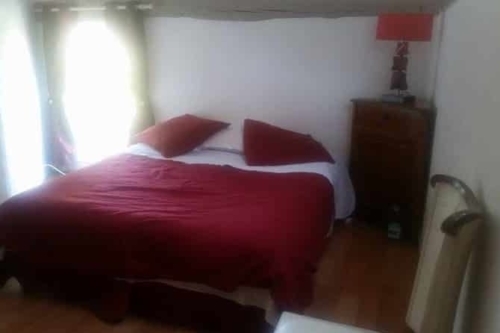 You can come alone or with your partner in the bungalow, with friends or your family and rent out our house, or even have a room in my house – I have many accommodation options. Check with me for the prices which vary a bit depending on the accommodation you choose and the number of people you are traveling with. I can arrange for lessons for you or several people, schedule more or less tours, drive you around, be more or less present depending on what you want. Contact me and we’ll discuss options and fees to make the best of your stay with me. 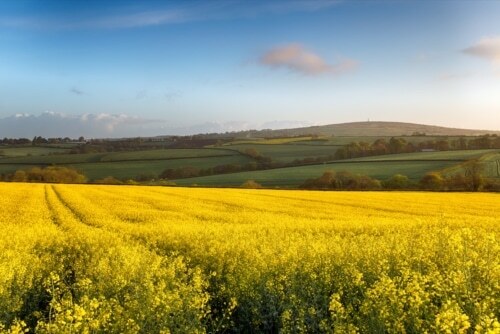 Follow Chantal’s Bilingual Posts On French Today, Where She Talks About Her Beautiful Region. My experience with Chantal in France was absolutely unforgettable. Chantal goes above and beyond in every way to make people feel welcome. From day one I felt comfortable i her home and the pool house felt like home right away! I would suggest traveling like this even if you weren’t learning a language! It is the ultimate way to have an all inclusive experience whilst experiencing the culture and customs in the truest fashion. Chantal was made to do what she does, from her relaxed approach to her continuous help with planning your vacation. She was a tour guide, a photographer, an incredible chef, a teacher who really really cares that you are getting as much practice as you can and most of all a friend! She is so patient as you would have to be to deal with me at the beginning (my french was horrendous) but she seemed to know exactly what to do everyday, what route to take to make everything easier for me. She also never made me feel rushed, even if her work day is over she is still there for you, and even on her weekend she brought me to the train station, to a party etc and that extra time and effort she puts in really makes all the difference. I have no doubt in my mind that she cares just as much as you do that you leave speaking the language. She even would make sure I had food for the evening, sometimes bringing over a tray with a hot meal, absolutely amazing treatment. She also went out of her way to put my moms mind at ease which was very kind of her. Stephane is just as inviting as well, he treats you as if you are a long time friend and her mother is incredibly kind and very patient. She was a joy to be around. The whole trip from start to finish was spectacular and if I could have I would have stayed two more weeks! I was immediately at ease with them both. In the short ride from the station to her house, she assessed my level of speaking, my abilities and my weaknesses. By breakfast the next morning, she already had a plan of attack, and by the end of the week, I felt totally at ease speaking French! Each morning, we had breakfast together and started talking as though we’d known each other for a long time already. Subjects included our work lives, our families or current events we’d seen on television the night before, among others. After breakfast, we moved right into a lesson designed for my personal needs on adverb placement or the subjunctive tense or an activity such as reading out loud, watching and discussing a video, improving vocabulary and learning current expressions – all discussed and explained in French (only rarely did I ask for an English translation). Chantal cooks lunch for her mother every day, and we all ate together in her mother’s house, just next door to Chantal’s. Her mother, Lilliane, is a delight. I enjoyed talking to her and hearing her stories. Chantal and her mother like the same television shows that I like to watch when I’m in France, so it was easy to find common topics. 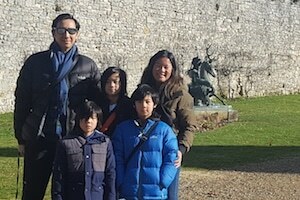 There are lots of great things to see and do in the area, but as it was a snowy winter, we opted for a chateau and a museum. 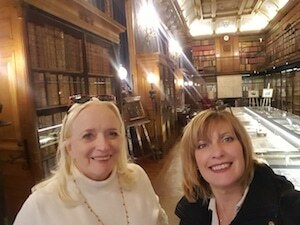 We enjoyed an afternoon at the Château de Chantilly, looking at the furnishings and the art, plus Chantal filled me in on a lot of the history of the place, fascinating!! As it was winter, the horses were not racing. I suggest that would be worth going back to the chateau for. One of the art galleries in the château. 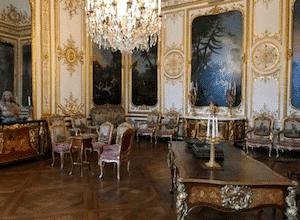 Chantilly boasts paintings by Ingres and by Raphael to name just a couple. As one of my homework assignments, I read two short histories about Camille Claudel and Seraphine de Senlis. I was to compare and contrast these two famous women artists from the Picardie region whose lives were very similar and yet different. We were able to visit a museum in Senlis where several of Seraphine’s tableaux were on display. 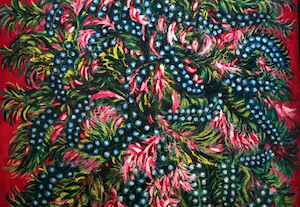 Here is an example of her large-format naïve painting of flora. Very colorful! I have to admit that I am taken with the program, with Chantal and her family and dogs. I can’t wait to go back. Next time for two weeks instead of one!! Following our course in April 2018, my wife and I decided that we would like to do another course and didn’t want to leave it until 2019. However as Chantal’s courses are very popular, we only had the choice of a week in October or the week immediately before Christmas. We chose the latter as we could combine our week with Chantal with a skiing holiday over Christmas and into January. 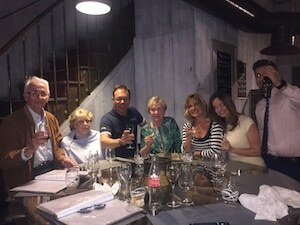 We cannot add to the positive comments we made in the review we posted for our course in April, except to say that once again our week with Chantal and her family was very enjoyable and worthwhile. Although there was a big difference between the weather we had at the end of April and the weather we had in December, we were comfortable in the apartment which was warm and cosy. This time we got to know Chantal’s mum and enjoyed our conversations with her every day when we had lunch in her mum’s lovely house. As Chantal knew us and our standard of French, from our memory of the lessons in April, Chantal raised the bar this time and what we covered during the week was at a higher level than the previous course, which meant that we started the course in December where we finished the course in April, when we both felt that our French had improved. Even though we had a holiday to look forward to, we were nevertheless sorry to leave. J’avais depuis plusieurs années acquis un niveau de français intermédiaire, mais je manquais de confiance en moi pour converser et parler de manière fluide. J’ai donc réservé un séjour d’une semaine en immersion totale en Picardie avec Chantal. J’étais un peu appréhensif dans le train de Paris à la Picardie, mais une fois ce court trajet fait, j’ai tout de suite été accueilli par Chantal à la gare et tout s’est ensuite très bien passé. Chantal a rapidement su évaluer mon niveau de français et a conçu ses cours en fonction. Son enseignement était très professionnel et les cours très structurés, intéressants et ludiques. Les excursions avec Chantal dans les environs étaient stimulantes et pédagogiques. J’ai également beaucoup apprécié le confort du studio privé, près de la maison de Chantal, dans lequel j’étais installé. A la fin je ne voulais plus partir! Le niveau de mon français s’est considérablement amélioré. Je projette d’y retourner l’année prochaine. Thank you so much to Chantal and to her family for a warm welcome and a wonderful experience! We had a great week! Our accommodations were roomy and comfy. I got to listen to French and to speak French all day…and Jim got to relax and hang out. Chantal’s French lessons were at the perfect level for me. She has a wonderful way of explaining concepts that makes it all seem easy! There were videos, conversation, writing exercises, reading, and discussion. The gourmet French meals that Chantal made each day were a treat! Jim and I both enjoyed sharing our dinner and talking with Chantal’s mother and with Stefan. I learned at lot on our visit to the Compiègne to see the reconstructed Wagon Lit where the armistice ending WWI was signed 100 years ago. 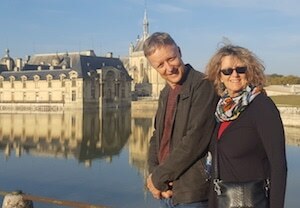 Our visit to Chateau Chantilly (Chantal’s second home) and to Senlis also gave us a good taste of the varied and fascinating history of the Picardy region. I’m so glad we had the opportunity to share a week Chez Chantal! I recently had my first immersion homestay experience with Chantal and I can say that it was definitely one of the best decisions I’ve made! I have been learning French for about 2.5 years and felt like an immersion would help consolidate my learning. The train from Paris took about 50 minutes to get to the train station that is not too far from Chantal’s home. Chantal and her partner Stephane were there to meet me, which was nice, and they were both welcoming. Thanks again to Stephane for carrying my very heavy luggage! The student bungalow behind Chantal’s house was very spacious and comfortable. I appreciated being able to have a private space to myself to relax, complete homework and watch French TV and movies. I felt overwhelmed initially and self-conscious about speaking French, however after a couple of days I gradually felt more comfortable with forming sentences and just having a go because Chantal was very patient. She provided feedback and suggestions in a gentle manner, even when she had to correct me on the same things several times! 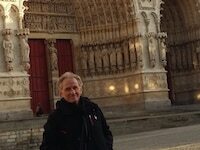 I appreciated the various excursions we did and also being included in some daily activities, which gave me more insight into everyday life in France. I also have to mention Chantal’s delicious cooking that I had the opportunity to enjoy for lunch each day with Chantal and her mother Liliane. By the end of the week, I was feeling more confident with my French and after I returned home, other students in my usual French class gave me positive feedback too. I would highly recommend anyone looking to improve their French to have a stay with Chantal! 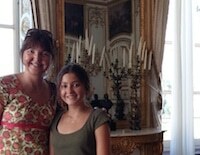 Recently I had the pleasure of spending a week with Chantal and her family immersing in the French language. 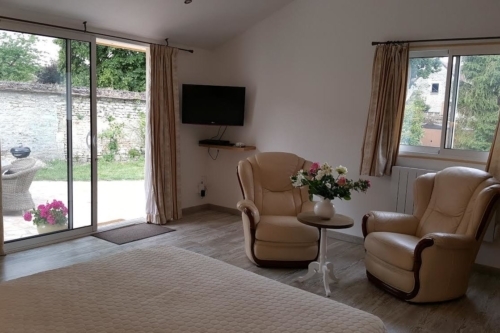 Chantal is located in a charming village North of Paris. I had been in France for 6 weeks prior to arriving at the home of Chantal, Stéphane and Liliane so I could improve my understanding of the French language, however the 2 previous immersion activities proved a little disappointing (Note from Camille: the 2 other immersion stays where not with the French Today teachers). Chantal is a good communicator and we had shared a few emails prior to arriving at Mouy. We arrived on Sunday as planned to a very warm welcome from the family including two lovely dogs and the French conversation began..and didn’t finish, it was the best experience of my entire trip and only wish I had spent more time with Chantal and, at the start of my trip. The lessons are based on where you are currently at in the French language and don’t follow a specific curriculum which I found exceedingly refreshing and very helpful. The studio was well equipped, modern and extremely comfortable. Chantal has an array of books and DVD’s, all in French of course. It is a help to totally immerse and I found it helpful to have the options at hand to continue the immersion when in the studio. Chantal is a great cook and the food was plentiful, varied and very tasty. 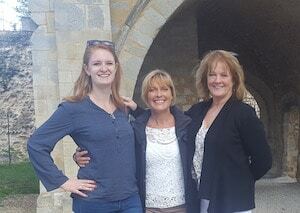 We began with breakfast and then lunched each day with Lilliane, the mother of Chantal who is fabulous, it was informative and fun to chat with a lady who has a vast and very different life experience. 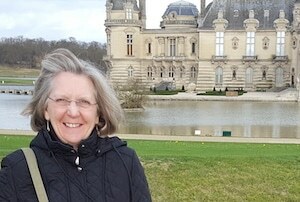 We went on a few excursions including “Chateau Chantilly” where Chantal was tour guide in French and I was translator to my husband in English I loved the experience totally and felt very successful with my level of communication. I have spent a fabulous, educative week with Chantal my teacher, cook and tour guide. I was very happy with the experience, my husband and i were welcomed with open arms and included in the family activities for the week. 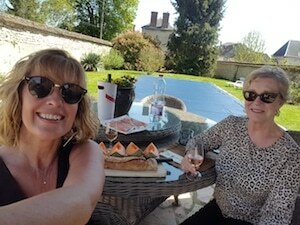 I highly recommend Chantal and this method of immersion if you are serious about improving all aspects of your French especially conversation, in my opinion it is the best option available in France at this time. My week with Chantal was exceptional on so many levels. First, Chantal is a very dynamic and inspiring woman who brings such passion and energy to her teaching – and in fact to everything she does. 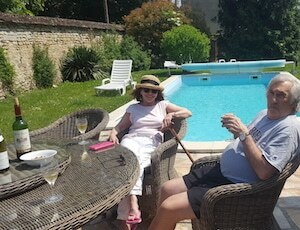 We spent six or more hours together each day talking about everything under the sun (in French, of course), with many excellent lessons in French grammar, expressions, culture, family life, cooking, history, and more. She clarified some key grammar points for me that I have long struggled with and explained them in a way that made great sense. I left feeling so much more confident about my language skills and had great success speaking and understanding people when they spoke to me during my subsequent travels in Paris and the south of France. She is exceptionally kind and genuine, and answered my millions of questions. Second, I had the lovely opportunity to spend time with Chantal’s family – her charming mother, her petit-ami Stefan, and, by luck, her niece and husband (and petite fille, Clothilde) who were visiting from Italy. 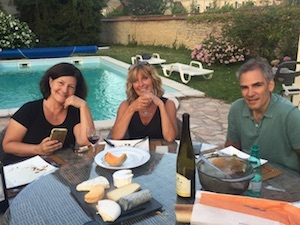 I was invited to share lunch each day with the family, and we all enjoyed Chantal’s wonderful cooking amid lively conversations about our respective cultures, politics, and the world – in a crazy mix of French, Italian, and English. I felt so warmly welcomed into the family and was honored to be part of their daily life. My daughter unexpectedly came to join us as well – long story – but Chantal welcomed her as well most warmly. Fourth, Chantal’s home and guest accommodations were truly a pleasure. Her 19th century country home is warm and inviting, the gardens are lovely, and the private studio for her students is exceptionally comfortable. The overall ambiance was that of tranquility and peacefulness – exactly what I needed. 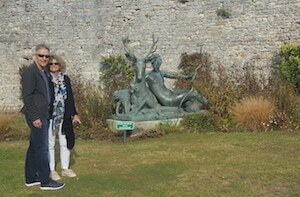 We took several tours – Chateau de Chantilly, where she gave an in-depth history lesson – and a morning in the town of Senlis (what could be better than clothes shopping with a very stylish and chic French woman). I look forward to returning to see her next fall. Many, many thanks! Brian and I had a wonderful week in Mouy with Chantal. As a couple we presented Chantal with a teaching challenge. My knowledge of the French language is as a beginner in many ways, while Brian is more advanced. Chantal took the challenge of teaching us both, at different levels and we learnt a lot – and had a lot of fun. It is a daunting thing to get on a train in Paris and head to meet complete strangers on a train platform but Chantal and her partner Stefan made that so easy. Their hospitality was a wonderful; the great accommodation in the studio by the pool was exactly as it looks in the photos. We had plenty of room to do our homework each day, read, write or just sit by the pool in the sun. Chantal is great cook and we had great food and great company at breakfast with Chantal and luncheon with her mother and extended family. She mastered catering for someone with Coeliac disease (needing a gluten-free diet) and did it seemingly without any effort. Of course all this happened in French! 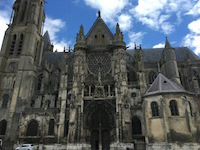 Visits to Beauvais, Chantilly and Senlis just added to the fun while we learnt – including doing our homework writing about the places we had seen. We are now traveling more extensively in France and beginning with a week’s immersion in the French language has been a great way to start our journey. Every day we remember the things Chantal taught us and try and practice, practice, practice! It is a long way from Australia to France but starting with some intensive French language study is making the rest of our journey here far more rewarding. 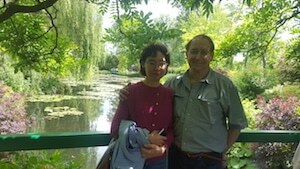 I have just spent a wonderful week studying with Chantal in Mouy. It was both stimulating and relaxing with so much to see and do close by. We spent every morning working together after taking the adorable dogs for a walk in the fields and picking up the warm baguette for breakfast, so French! Chantal is an exceptional teacher, at no time did I feel at all stressed. She is so encouraging and was able to tailor the morning lessons perfectly to my level. I was even inspired to do my homework and feel I made significant progress, thank you! Each day we shared a delicious lunch with her delightful mother who was kind enough to share her childhood memories with me. It was also a joy to meet Stephan who was so much fun and was so welcoming. Our excursions to Chantilly and Senlis were hugely enjoyable and informative with the visit to the markets on my last day a perfect finale to an amazing visit. 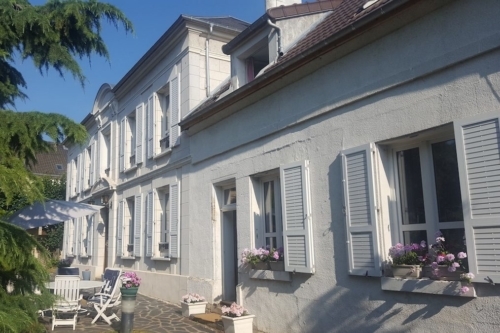 Altogether I feel I have made a new friend and can’t wait to return next year for another wonderful stay in this beautiful home in this very special part of France. In a word, Chantal is amazing! Part gourmet cook, part tour guide, part French language instructor. But she is even more than that …Having just finished our second year in a row with her immersed in the language and the culture, I think of her as more of a friend. Like a distant cousin who you can’t wait to see again and again. The time we spent together is fun and informative …the very best combination for instructional learning. Her home is quiet and comfortable. Her style is effortless. If you’re looking for someone to learn with in an immersive environment, look no further. Chantal is simply the best. 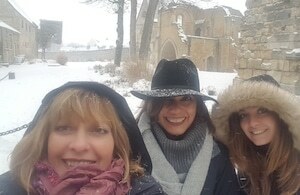 My wife Rosemary and I have just spent a lovely week with Chantal in the interesting village of Mouy. I was there as the student with my wife just enjoying a relaxing week. 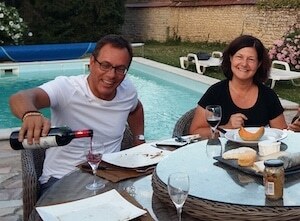 We were met at CDG by Chantal and Stephane and although we did not expect a meal, were served a delightful salad by the pool as we got to know each other that first evening. Chantal is a charming lady, a very patient and effective teacher. The three hours or so each morning went very quickly. I especially benefited from listening to spoken French and to being gently but persistently corrected in my efforts to emulate this. I have pages of notes now with enough homework to last several months. Chantal has advanced my understanding of some of the finer points of grammar. Lunches with ‘Maman’ (her mother) were great and we were able to converse with her on a number of subjects of mutual interest. The excursion to Domaine de Chantilly was very enjoyable as also to the Forest of Compiegne, historic railway carriage museum, where the armistice ending the first world war was signed. Accommodation in the guest bungalow, adjacent to the pool was very pleasant, with every comfort and facility. 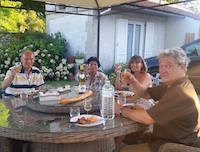 Both Chantal and Stephane were kindness itself; we thoroughly recommend a French immersion stay with Chantal at Mouy. I had the pleasure of staying with Chantal for a week of French Immersion. My stay was fantastic, the accommodations are very private and feel like home. Chantal and her family are so welcoming and it was wonderful to get to have meals with them and be part of the family. 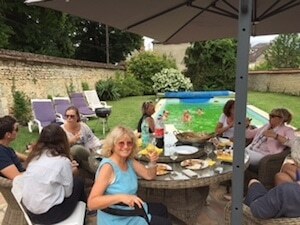 Lucky for me I arrived on the day of the World Cup so there was a fun party with lots of friends who were also so friendly and wanted to all help me speak French. It can be a bit scary going to do this type of trip, you don’t know where you are going or who you are you staying with, but I would highly recommend a stay with Chantal to anyone I know. I hope to come back next year and do it again as well. Her home is in a wonderful small village just North of Paris, surrounded by farms and countryside. It is very peaceful and relaxing. Chantal is a fabulous teacher, each day started with breakfast and some structured lessons. Chantal is great at explaining everything (in English when needed), and she has a great way of helping you learn the language. We would have lunch with her family as well and speak in French all day. The days were challenging for me as a beginner but I never felt lost and Chantal was always there to help me. I loved going for walks with the dogs and getting to practice my language skills in friendly conversations. By the end of the week I was feeling much more confident in my French and could see a big difference from when I started. It is crazy to wake up each day and actually be thinking in French, I loved it! Chantal is a great host, we went on several excursions to places I wanted to visit and she was an great tour guide all while continuing the French lessons. I highly suggest you make a reservation for this immersion experience, I can’t wait to come back. 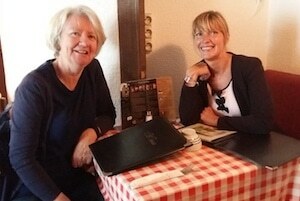 My friend Linda and I recently returned from a very nice two-week stay with Chantal. Chantal is one of the nicest people we have ever met. She is extremely informal and we immediately felt very comfortable. I also want to mention Stefan, Chantal’s partner, who was so cordial and friendly all the time. 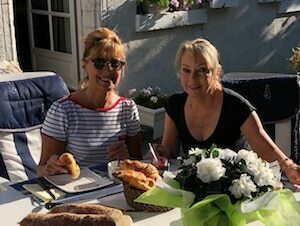 Each day (Monday – Friday) started with breakfast with Chantal where we spoke entirely in french. Directly after breakfast my formal lessons began (Linda had elected not to take part in the formal instruction). Chantal immediately determines the level you are at and focuses her lessons on that. Most days there was a homework assignment generally consisting of reading articles or chapters in a book, which were discussed at the next lesson. A short time later each day we joined Chantal and her wonderful mother for an excellent lunch in her mother’s house (which is attached to Chantal’s house). Again, of course, all conversation was in french. Special note – Chantal and her mother make wonderful desserts! Local outings with Chantal were excellent, and quite educational, and of course during that time all conversation was in french, adding to the immersion experience. Chantal has two very friendly dogs and a cat who are wonderful to watch and interact with. 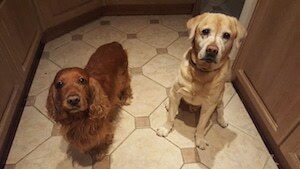 The dogs are quite funny in their own way, clearly fine with having people studying french in their house. Linda and I went to Paris on the middle weekend and Chantal graciously drove us to a train station a little further away so we could get an express train. I must add that she not only picked us up at the airport on arrival, but also drove us to our hotel for a few more days in Paris after the two weeks. All in all a very very nice time. Linda and I are already planning on a return visit to Chantal, which incentivizes me to actually study and listen to French at home over the next year. If your dream of speaking beautiful, fluent French has hit a real-life road block, perhaps you need to sink deeper into the actual culture and lifestyle of France. Immerse yourself, comfortably, in the world of Chantal, as we did. Chantal is beautiful, with a cheerful and happy disposition. She constantly did everything she could to make our stay that much more enjoyable. Her partner Stephane, is fun and easy to be around. Chantal’s mother lives in a separate part of their 300 year old chateau home which is replete with classic features of crown moulding and carved plaster ceilings. Our “petit” retreat was a comfortable and well appointed guest house on the property next to the swimming pool. We enjoyed the delicious meals Chantal served to us. The dogs and cat were also welcoming. We think the cat was a pirate in another life. You will understand when you visit. The lessons were well designed to improve our French, each day’s lesson was different than the day before. As well as the conversations which flowed around the table at meals, inside the house, outside in the garden, on walks with the dogs. Every day fluency and comfort in speaking improved. And even when Chantal was busy preparing meals, she was listening carefully to what we said and quick to correct our guffaws. A highlight was reading one of Chantal’s books in French and laughing out loud at how drole I found the writing. 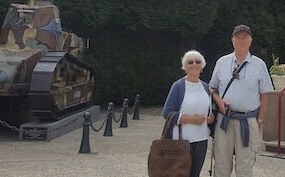 Our excursions to Chantilly and the War Museum were interesting, educational and most importantly, fun. 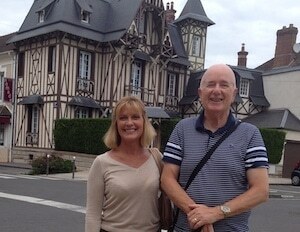 I recently returned from a wonderful six days with Chantal in the delightful village of Mouy. She and Stephane were very welcoming from the moment they met me at the station of Clermont de l’Oise and I immediately felt at ease and knew I would enjoy my stay. 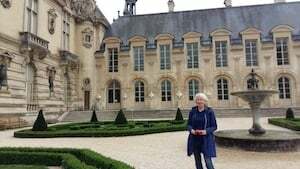 I had such a varied and interesting time with visits to the Château of Chantilly, Beauvais and Senlis with my knowledgeable guide and as a great animal lover it was a bonus to walk with Chantal and the lovely dogs in the attractive countryside. Titi, the venerable cat had a great purr when he was stroked. 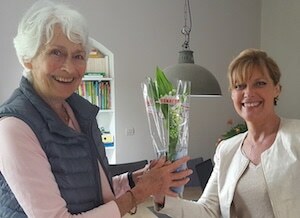 It was good to be in France on 1st May and be given lily of the valley (les muguets) by Chantal and Stephane. (I have always loved those flowers and used them for my wedding bouquet years ago). It was surprising how much French I managed to speak each day with Chantal and her family and I felt I acquired much more confidence in speaking this beautiful language. Chantal is an excellent and encouraging teacher and we had a lot of laughs! The studio flat is very comfortable and looks on to a pretty garden and swimming pool and it was lovely to hear birds singing and no traffic sounds. In spite of my being vegetarian and allergic to the onion/garlic family, Chantal created delicious meals which she seemed to produce effortlessly. 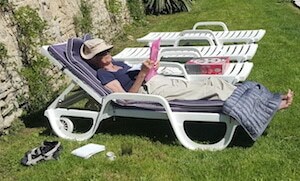 I have recently returned from a wonderful two week stay chez Chantal in lovely Mouy. This was my first in home immersion experience which exceeded all my expectations and I am already planning a return visit. 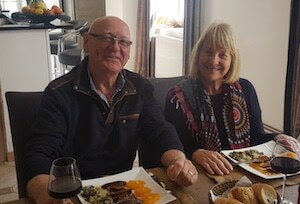 My first day I was treated to a lovely and delicious traditional French Sunday lunch, en famille, at the home of Eliane and Benjamin. Eliane, the daughter of Chantal, is also a French immersion instructor and was hosting a couple from Canada in her charming home. Right from the beginning, I felt like a member of the family. My culinary adventure was just beginning as Chantal is a superb chef in addition to her many other talents. I kept recipe notes along with those from my lessons. I looked forward to our morning sessions which were always interesting and varied and well suited to my level. The dogs always let us know when class was over and it was time for us all to stretch our legs and take a nice walk in the countryside. The accommodations couldn’t have been nicer. The studio is spacious, quiet, serene and very private. I benefited enormously, not only from my time with Chantal, but from my conversations with her charming mother and Stephan. Thank you Chantal for an unforgettable experience. Thank you so much for a wonderful week in France ! I learned so much more than I thought I would in a week and found myself beginning to think in French. You have improved my French dramatically. The time spent with you in your small village forced me to think and speak only in French. This was a big plus since it is all too easy to drop back into English when you can’t really think of the French word. 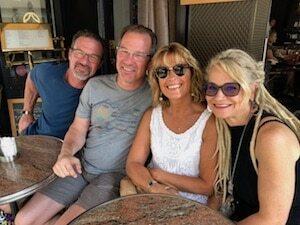 Graeme and I spent a fabulous week with Chantal. We arrived at Easter Sunday and we were made very welcome. 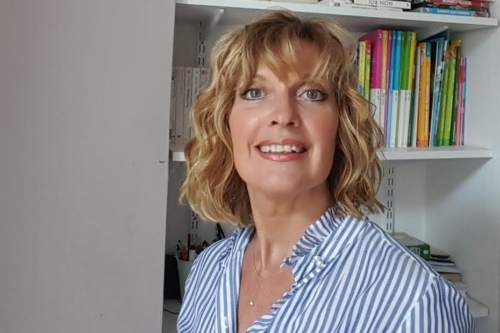 Chantal is an excellent and an experienced French Teacher who could understand needs and gave us not only a deeper insight into the French language but also into the French culture. Her sunny disposition throughout the day was remarkable as was her amazing meals. We felt we were part of the family and enjoyed lots of fun and laughter together. 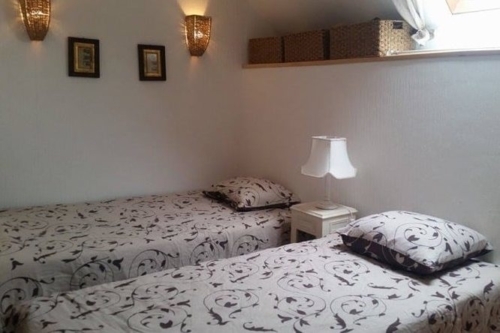 The accommodation was a separate studio with everything that one could wish for, modern and very comfortable. Chantal & Stephen went above and beyond to include us in their activities and the week passed so fast we were sad to leave. We can highly recommend French immersion with Chantal. What can I say that hasn’t already been said? My week-long stay with Chantal was exceptional in all regards. I felt welcome from the moment I arrived and my time with Chantal and her family exceeded all of my expectations. My objective was to speak French as much as possible, and this I did from morning ‘til night! Chantal devoted all of her time and attention to helping me and my French improved noticeably. I loved everything about my stay – the excellent accommodations, the delicious meals, the local excursions, our daily walks with the dogs, and movies, ice cream and non-stop laughing with Stephan. I’m already planning my next visit! Having read quite a number of the excellent reviews that Chantal has received during the four years that she has been with French Today, it is difficult to add anything further to them. With so many wonderful reviews from so many people of different ages, abilities and nationalities, our expectations were high and we certainly weren’t disappointed. In fact, our course with Chantal exceeded our expectations and was not only rewarding but also very enjoyable. Chantal has a great personality, as does her partner Stéphane, and we were made to feel very comfortable and relaxed from the start, and during our stay we felt as though we were staying with old friends rather than with people we had just met for the first time. Chantal is a very good teacher and the morning lessons following breakfast were well structured, varied and tailored to our requirements, levels and personalities. When it comes to learning a foreign language, everyone has their strengths and weaknesses and often a different way of approaching things. My wife and I are no exception and Chantal quickly understood this and organized the lessons accordingly.There was no strict timetable and sometimes we would sit for awhile after breakfast and talk of all manner of things over another cup of coffee. The meals that Chantal provided were delicious and we really enjoyed our daily walks before lunch with her two lovely dogs, as it was nice to stretch our legs after the morning lessons and it provided us with further opportunities to practise our spoken french. We enjoyed our trips out with her and on a visit to Compiègne, Chantal took us to a book shop and helped us to choose a good number of books for our future reading. 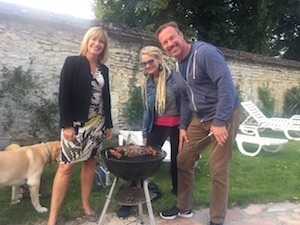 Assisting Chantal with the assembly of a new gas barbeque during the last afternoon, in french of course, was fun and we enjoyed a very nice meal with Chantal and Stéphane that evening, cooked to perfection by Stéphane using his new toy. Chantal was always bright and cheerful and we had some good laughs whilst in her company: she is one of the nicest people we have ever had the pleasure of meeting and she rightly deserves the credits she has received. It is easy to see why her courses are so popular and why it is necessary to book them such a long time in advance. We are definitely planning to do another course with her as so many others have done and continue to do. Meeting Chantal and Stéphane was a real pleasure which we hope to repeat in the not too distant future. Je tiens à remercier Chantal pour cette semaine si agréable. J’ai beaucoup appris et j’ai bénéficié de sa patience lorsque j’ai commis des erreurs élémentaires. Sa cuisine et son hébergement sont superbes avec la ville située dans une partie étonnante de la France. I would like to thank Chantal for such an enjoyable week. I learnt such a lot and benefited from her patience when I made elementary mistakes. 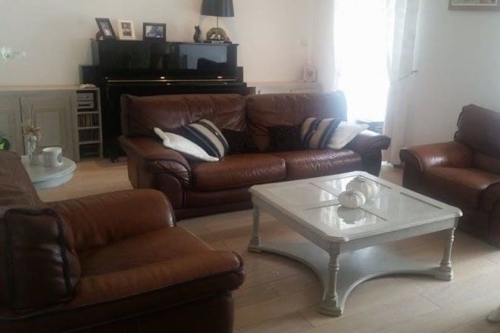 Her cooking and the accommodation are superb with the town situated in an amazing part of France. My week studying French with Chantal was excellent. Chantal immediately assessed my needs and developed an educational plan to take my French to the next level. The bungalow is not only spacious but it has a library of books and movies in French (different levels) so I spent time reading during my off time. Chantal, her family and dogs were so welcoming and made the meals a special time for learning and sharing. The day trips that Chantal planned for us were fantastic as she was able to give you historical facts. I am already thinking of returning next year! This immersion week was one of the best experiences of my life! Chantal and her husband treated me like a member of the family. They even included me on an excursion to the Vincennes Hippodrome for the Grand-Prix d’Amerique horse races; what a great experience that was! The accommodations were lovely and the meals delicious. Chantal tailored the lessons to meet my needs and gently encouraged me. 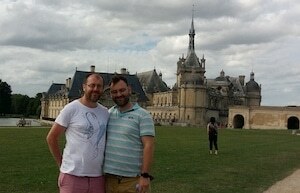 We visited Chateau Chantilly and the village of Senlis. We also played Scrabble (in French) with Chantal’s mom one afternoon. That was a great deal of fun! All of these activities allowed me to use my French and gain confidence while doing it. When I left Chantal’s home, I met my husband in Paris. While there, I was able to communicate in French and felt so much better about my French language skills. Thank you Chantal! I’ll be back, perhaps in the summer next time so I can enjoy your gardens and swimming pool. 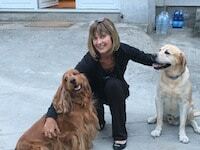 What a delight it was to stay with Chantal and her two beautiful dogs. My husband and I and our three children had a wonderful time with warm welcoming Chantal who cooked delicious meals and offered us the delightful comforts of her home. 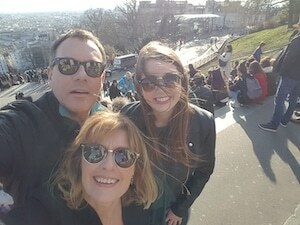 As pretty much beginners we learnt so much and in particular my husband who went to some Paris hospitals the week after – it was invaluable to him to have had this immersion week first. A relaxed and fun environment to learn real, conversational, practical french ! I just came back from a great time in France ! I am a sales director in the United States, working for a large international French Company whose headquarters is located just outside of Paris. My vision is to either work at HQ or have a European/Global role of some sort in a few years ( after my last child is off to college ). Knowing French would come in handy. I have been studying French by myself for over 3 years now, doing the usual websites, textbooks, but also having a tutor for a year and going to weekly groups where we all try to speak French ( very hard ). I felt that it was the time for an immersion program in France and I chose Chantal. Her profile seemed very nice and comphrensive, and I liked the proximity to Paris and CGD. I stayed one night in Paris at an Airbnb and then took a TER up to a station close to her the next day where she picked me up. The pictures and agenda are what is posed on her site. 5-8 hours of French with her per day: during 2 meals per day, grammar, videos, trips, homework. For the nights you are on you own. And actually, I was so wiped out from being “on” during the day all I did was to buy a bottle of wine and some frozen lasagna and stay in my room each night, doing homework and watching local French TV. In the picture is also Chantal’s daughter, Eliane, who is starting up her own immersion program with French today. She came over for a couple of days to say hello. She is very nice and I would recommend her as well! In short, a very very worthwhile trip, way way mentally harder than I was thinking. I highly recommend Chantal and the entire experience for French language immersion. My time spent in Mouy with Chantal and her family was terrific. I had the best time. Chantal is an excellent teacher and adapts a program to suit your specific needs. Chantal focused my learning through watching dance dvds and programs related to dance on youtube as this is a passion of mine. We even went to the cinema to watch a live broadcast from Moscow of the Bolshoi Ballet performing Romeo and Juliet! Chantal’s meals are beautiful. Her dogs are just gorgeous and I enjoyed going out on walks with her and the dogs. This was another opportunity to practice my French. We went on outings together. Chantal took me to Senlis where they have a market. We went to Albert and visited the Somme Museum which was very interesting and we also went to Compiegne and Amiens to do some retail therapy. I just loved every minute of it. Thank you very much Chantal for making my trip such a memorable visit. The week I spent with Chantal at Christmas time was very enjoyable and absolutely flew by! I was constantly working and speaking French yet she made it feel like a holiday. 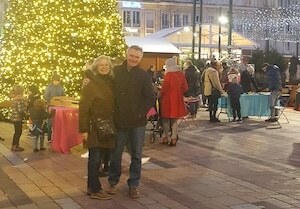 We went on many outings, including Chantilly castle, the cinema and the Christmas market. 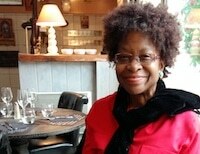 Chantal was always kind, patient, a wonderful teacher and a fabulous cook. It was an experience I will never forget and I hope that one day I can go back and do it again! The two weeks I spent with Chantal were absolutely fabulous. Everything was perfect. There is nothing better than one-on-one instruction from a competent teacher when learning a new language and Chantal is truly a professional teacher, as well as being charming and a great cook. The room provide was ideal, private and equipped with TV, DVD, a microwave and fridge. 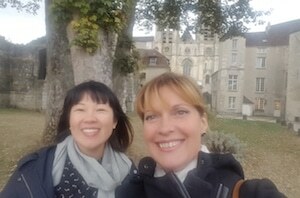 The village of Mouy is charming and Chantal took the time to serve as personal guide and chauffeur for a tour of the château de Chantilly and the cathedral and monument to Jean D’arc at Compiègne. In short, the sojourn could not have been better and I am looking forward to the next time! I spent a wonderful week with Chantal and my only regret was that I hadn’t booked two weeks. My confidence in speaking French increased significantly and I’m sure all my silly mistakes would have been eradicated with a two week stint. Chantal is a wonderful teacher, who very easily and quickly accessed my capabilities and adapted our morning sessions to suit. I enjoyed our discussions on topical events and I particularly enjoyed the films we watched together. I now can watch a French film without subtitles! The studio was warm and comfortable despite biting winds and a smattering of snow. It was a joy to be able to make my own cup of tea first thing each morning. Chantal can rattle up a delicious meal effortlessly and she coped admirably with my yeast intolerance. I can still taste her delicious quiche. It is difficulty to know if Chantal is part of Mouy , or Mouy is part of Chantal. Here is a small town with a warm ambiance. If one wants good French instruction, this is the place. If nightlife is your wish, it is not. My three weeks flew! Chantal is an experienced teacher, comfortable with all ages. The teaching method is based on conversation. Chantal is really patient. a super listener, and very good explainer. Her outstanding feature is the happy outlook; never was I bored or embarrassed. Every student has small problems and these we resolved without issue. The teaching was excellent : reading, homework correction, a video and some grammar each day. There was every opportunity for questions. The cooking excellent also. Added were excursions, including Compiegne, where Foch and later Hitler signed surrender documents. I was very pleased to have been accepted to this home: YES I improved my use of la belle langue francaise. I had the pleasure of staying with Chantal for two weeks this September. 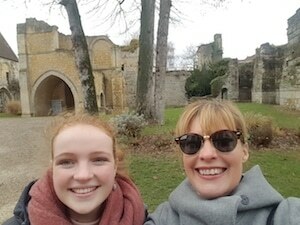 It was like a dream come true – being with a friend who could help improve my French while having fun and improving my understanding of French culture and experiencing life in a small French town. During the formal lesson part of our daily interactions Chantal quickly assessed where I needed to review some grammar points. So we incorporated that into the lessons that also included watching video clips together and discussing the content. It really helped with my oral comprehension and production. Once back home I attended a workshop for oral comprehension using TV5 Monde clips, and everyone, including myself, was surprised how much I had understood after listening to the programme just once. Chantal also introduced a theme for our two weeks together. So we watched videos and a movie around the theme of the First World War. And we visited together the Armistice Museum near Compiègne. This approach allowed me to understand deeper aspects of French history in the 20th century and its culture. One cannot forget the meals together when talking about a stay with Chantal. During our visits to the bakeries in the mornings I learned a lot about the different types of breads. And it was a delight to chat with Chantal as she cooked, to get recipes and learn some cooking tips. I have already tried some of her recipes to the delight of my family. And seeing her quickly and efficiently prepare delicious and healthy meals has encouraged me to try different ingredients and to cook more at home. I have been recommending Chantal’s course to friends, and I can’t wait to go back myself. 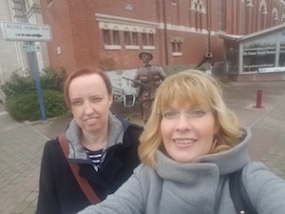 I had a really enjoyable and profitable week with Chantal this September, my husband went off to Amsterdam so I could get as much immersion as possible and this worked very well. Chantal’s lessons began at breakfast with our conversations and continued throughout the day, some of it structured and some of it unstructured conversations with Chantal while shopping or walking her two beautiful dogs or other conversations with Chantal’s family at coffee and/or meal times. Chantal is an excellent teacher, she picked out a couple of my weak areas to work on and encouraged me in my progress. At night I was well occupied with my homework and also watching some of the great collection of DVDs in my garden studio. All in all, a fantastic experience, both in language learning and in experiencing a different culture and country. In order to describe my fantastic experience in Mouy I would need to write a book, but in this case I prefer to summarize in a few words … it has exceeded all my expectations in all areas!!! Chantal is just perfect as a teacher, chef, tour guide, personal trainer (yes, she also cared about my health taking me for a walk every day with her dogs for a wonderful forest). It is also important to mention the wonderful family that she has, making me feel at home! Chantal once commented that I was her first Brazilian student but depending on the campaign that I’m doing with my friends in Brazil, I´m sure that very soon “Chez Chantal” will become the Brazilian Consulate in Mouy!!! 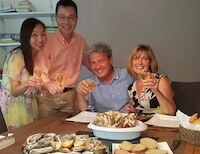 My wife and I had a wonderful stay at Chantal’s home. 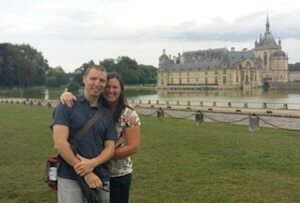 I am a French teacher and my wife a non-French speaker, but we both had a wonderful time. The lessons were informative and catered to my current abilities. Chantal helped me explore areas of interest to me, and I was even busy working on my French even before my stay (via email communication about the logistics of our trip). The food she prepared was delicious, and I learned about several aspects of traditional French cuisine from watching her prepare food. A special highlight of our week was sharing a meal with her mother and companion. They were all very welcoming and interested in talking with us. The student residence was plenty spacious and very comfortable! We watched a movie about a historical figure of local origin (Séraphine de Senlis) only to visit her town and even see her house later in the week. 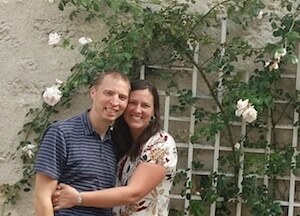 While the immersion aspect of our stay was really for my benefit, 5 days’ worth of meals together found my wife understanding and speaking a lot of French by the time we had completed our stay! Thank you for the enjoyable time! We were surprised at just how much fun we had with Chantal and what an amazing experience it was! Her home is very beautiful and comfortable and we did a lot of laughing that week! Her warm and friendly style makes you feel very much at home. Her teaching was very personalised and professional and her delicious cooking was such a treat each day! The location is beautiful and quiet and she took us to a couple of great outings nearby. All in all it was a wonderful experience we definitely want to do again! Myself and partner Simon spent a great week in the company of Chantal and Stéphane. The house and bungalow accommodation were a perfect set-up in the centre of a very nice little town. Lessons were relaxed yet intensive, and structured to suit our level of French. Food was always delicious, I ate an obscene amount of cheese and drank far too much wine, but I’m sure it all helped to get the French dialogue flowing! 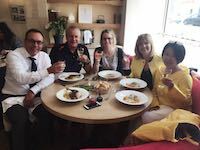 The trips out to Château de Chantilly and the marché were really enjoyable and a good chance to practise what we’d been covering in the lessons, and we really appreciated the meal out with Chantal and Stéphane and some of his work colleagues towards the end of the week. Overall a very enjoyable, educational and at times exhausting week … I guess that must have been down to all our bike rides Stéphane! I was a bit apprehensive at first about doing an immersion trip with my wife and children, since they do not speak or understand a word of French. Chantal put us all at ease immediately. Her English is excellent, but she purposely spoke only French in my presence and I translated for my family. My 9 year old daughter and 5 year old son amused themselves in the pool and loved playing with Chantal’s 2 wonderful dogs. At the end of the trip, my daughter talked about how much fun she had and asked if we could go back again next year. As a teacher, Chantal is very knowledgeable and supportive. Her explanations of various points and responses to my questions were very clear and helpful, and our discussions of French politics and culture were extremely interesting. She laughs easily and we had a lot of fun during our class time each morning. 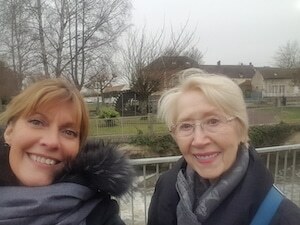 In the afternoons, we visited several of the sites around Mouy, including Compiègne, Chantilly and Pierrefonds, and I was impressed with Chantal’s in depth knowledge of the history of each. Her anecdotes really made them come to life. 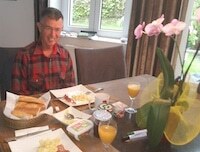 The accommodations were excellent, the atmosphere was very relaxed, and I should add that Chantal is an excellent cook. Her companion Stéphane was very welcoming and kind to us. 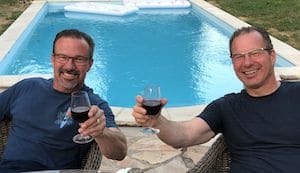 He coined the slogan for the week as we sat by poolside in the sunshine sipping wine one evening: Ça pourrait être pire! I couldn’t have said it better! This summer I had the pleasure of staying with Chantal at her home in Mouy. 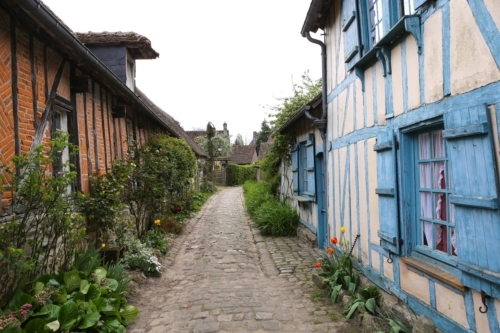 Mouy is a charming petite village with plenty of interesting places to walk. Chantal took me with her everywhere which greatly enhanced the experience of speaking french regularly. It also gave me an insight into daily life in France. We went for walks with the dogs in the fields or in the woods, we went to the supermarché, and a big box store. 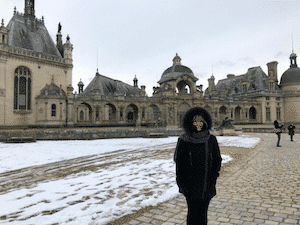 We also visited the Chateau de Chantilly where Chantal demonstrated her knowledge of the history and shared interesting details of the Chateau and surroundings. I stayed in the bungalow which is quite luxurious with a small kitchen, large bathroom, and all the amenities. There is even a large television with a large video library so I could watch the news in french or a movie. This proved very useful as a subject of conversation and I learned a lot about french history and culture at the same time. Chantal is a patient and innovative teacher giving me lessons that included grammar, comprehension and conversational practice. She is also open to suggestions and tailored the classes to my particular needs. Most importantly, she makes learning fun. Her hearty laugh and affectionate manner immediately defused any tension I felt about speaking french. The highlight of the week was the quatorze juillet party at the end of the week. At my request, Chantal included me in all of the preparations, chatting with me in french as I peeled shrimp or chopped onions. For me, there is no better way to learn a language than by doing ordinary activities in a relaxed setting. 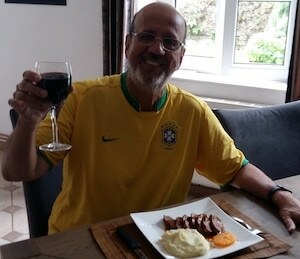 I felt like one of the family as we celebrated the independence of France with their close friends. Their friends were very welcoming and inclusive. They encouraged me to speak french with them as we ate, drank, and sang our way through the day. It was an experience I will never forget and one I look forward to repeating very soon. It was my first immersion experience and I have no idea what to expect especially I am traveling with my husband who was not taking the course nor speaks French. Chantal made it all seemed so easy, natural and such a breeze; it was just like staying with a longtime friend! The moment we arrived, she welcomed us with open arms and was so generous and kind to us..I truly felt at “home”. From the very beginning I communicated with her (from Singapore) until I left, I spoke or wrote nothing BUT French. So, immersion started even before I arrived in Mouy, That’s fantastic! The week experience with Chantal and Stéphane was total immersion.. Stéphane ( her partner) is such a warm, jovial and friendly person, that added more values to the immersion.. we have thoroughly enjoyed ourselves and gained so much useful local knowledge besides learning French. That is what I deemed as TRUE Immersion! Once again, a BIG thank you and hugs to you and Stephane ! J’ai hâte de venir l’année prochaine ! I spent a wonderful week at Chantal’s. She catered her courses to exactly what I needed to learn and taught in a way that was relaxed and comfortable. Meal times were delicious and fun. The outings were interesting and enjoyable. I learned a lot and became confident in speaking French. Merci pour un formidable séjour. I had been to an immersion course in France before but outside of the class the students (myself included) thought and spoke in English. I was never able to drop the translation to and from English going on in my head. This was different. I was the only student. We didn’t have classes as much as we had conversations. There was no mental drifting back to English while another student spoke. It was a far more intense (and exhausting) experience than being in a classroom setting. Chantal had a very special ability of challenging me at my level without letting me feel lost or discouraged. I improved and she maintained a gentle level of pressure pushing me on to improve further. If you are serious about improving your French communication skills this program works. I cannot recommend an immersion stay with Chantal highly enough. 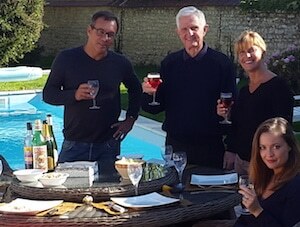 I was the lucky beneficiary of someone else’s cancellation and spent a week at Chantal’s lovely home in Mouy, France. Chantal is incredibly welcoming and immediately puts one at ease. Although my first day of full immersion was exhausting, Chantal was able to quickly pick up my areas of weakness and find ways to focus on them for the week. We did grammar lessons and discussions in the mornings and attended to French daily life in the afternoons. We took day trips to Senlis and Chantilly, and I enjoyed them both very much. In addition, Chantal is a wonderful cook! As I am someone who typically cooks for my family, Chantal’s cooking really made me feel like I was on vacation. It was a wonderful to have three meals a day prepared by her. And the studio by the pool was absolutely perfect. But most importantly, my French really improved even though I was only able to spend short week with Chantal. I am very hopeful that I will be able to stay with her again, but for a longer period. I’d be more than happy to answer any questions about Chantal, and I’ve already recommended her to several of my friends. Chantal is multilingual, a gourmet cook, and intellectually gifted in the arts, politics, geography, and history. She’s also a demanding yet patient professor who loves French and the fine points of French grammar. 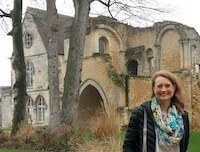 I studied under Chantal in her home in the village of Mouy as an immersion student in French from Feb. 5-11, 2017, and I’m amazed at her ability to tailor her teaching to my needs. My immersion experience was a surprise birthday gift from my daughter. I would like to think that if I had planned the experience for myself, I would have been better prepared. But enough excuses. The bottom line is that I’m a true beginner in French, and Chantal assessed the situation quickly and taught me as much as she could, using exercises from three workbooks and several videos. She also used everyday experiences as teaching tools. When Chantal cooked and served meals, she spoke French – and translated into English when it was clear that I had missed something. She lovingly cares for three wonderful pets – two charming dogs and an elusive cat – and she took me on walks with them and used that time to speak French and explain various aspects of the culture. When we went to a grocery store, Chantal used that time to explain unique aspects of French culture. We also took two fieldtrips in which she spoke French constantly and taught history. 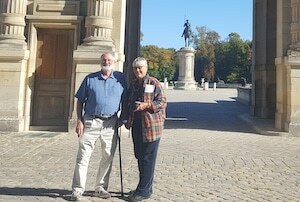 In one outing, we visited the Domain of Chantilly castle, which was the home of Prince Henri of Orleans. She knew so much about the castle, and explained those details in French. Likewise, we took a daytrip to Senlis, where we visited the magnificent cathedral there and a traditional French market. We also had lunch. I was nervous about speaking French with the merchants at the market and the waiter at the restaurant, but Chantal gently pushed me and corrected me patiently. Overall, my immersion experience was intense. That’s one reason the studio that Chantal had built for her students is so perfect. The studio, which is adjacent to her home, is a self-contained apartment equipped with wifi, a TV, a shower, and a kitchen. I was grateful for that space because after our daily 3-plus hour lessons, I could go back and have a quiet place to get my homework done. I also completed work tied to my job back in the Washington, D.C., area. Before the program, I read other students’ reviews that mentioned Chantal’s cooking. Now I understand that words cannot do her cooking justice. Eating her meals is like dining in a five-star restaurant where the food is incredibly fresh – and cooked and seasoned to perfection. In short, I cannot imagine a more valuable French immersion experience than the one I had with Chantal. Her teaching philosophy is that students should be exposed to the way the French really live, and she gives 2,000% making sure that her students get that experience. I am lucky, indeed. My brother and I stayed with Chantal for a week and we couldn’t recommend it more. Our stay was really useful and our confidence and ability were hugely improved by our visit. Before the trip we were both daunted by the prospect of spending a week away from home in a French home; however Chantal is lovely and our time with her seemed to fly by. 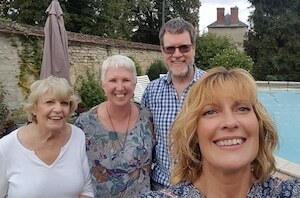 We learnt lots of French, ate delicious food, spent lovely days out (we visited the Louvre and Beauvais amongst others) and generally had a really good time. 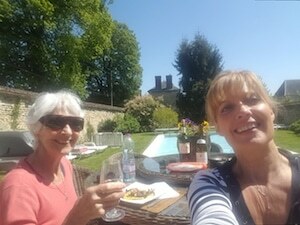 I would thoroughly recommend a stay with Chantal for French speakers of all abilities as you will return home having learnt a lot and had a jolly good time. My two week stay with Chantal was such a great experience. When I met her for the first time at the airport she put me at ease straight away. I felt like I had known her for years, not for 5 minutes. Chantal welcomes you into her family and makes you feel a part of her family. My French is beginner and she adapted a program to suit. I must say that she is very patient. A typical day would be breakfast together, class, lunch together and then there would be a couple of afternoons where we would go out shopping/ sightseeing. It was so much fun putting into practise what I had learnt that morning in class. I even got to watch a couple of French movies. Chantal’s cooking was the best ever. She is very talented. I wish I could cook like her. I also liked the walks that we would go on with her beautiful dogs. I will definitely be coming back. Best thing I have ever done. My sojourn chez Chantal was extremely rewarding and fun. She and her family were always very considerate and welcoming. They could not have been nicer! Chantal was a cheerful and accommodating teacher, ready to focus on the things that interested me the most. Lessons were well planned, homework was useful, conversations throughout the day—on a variety of engaging subjects -were reinforcing and illuminating. Several enjoyable trips to beautiful and interesting places in the surrounding area offered a welcome change of pace. Afternoon walks in the nearby fields or woods, with her two adorable dogs, were also great. Meals together with Marco and their daughter were lovely, as were occasional dinners with her very sweet mother, who lives next door. I learned a lot and found myself speaking with increasing ease and confidence. The private accommodations just across the courtyard were both comfortable and convenient. I had everything I needed for the perfect combination of vacation and study. Thank you, Chantal, for a memorable visit and for receiving me in such a warm and caring way. You are a really special person, and I feel I’ve made a wonderful friend! I had a lovely week with Chantal in Mouy. 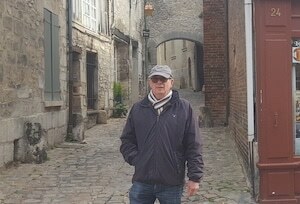 I live in the Lot et Garonne and decided I need to improve my French as there are a lot of English people living in this area and it is not every day that you have to speak French! I was extremely nervous and was not sure what to expect but from the minute I arrived Chantal and her family were absolutely charming. 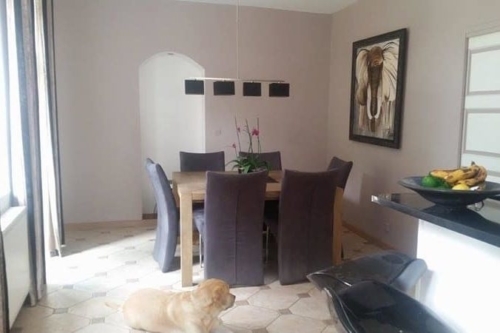 I felt very much at home and the formal tuition time just flew by, Chantal made it very interesting by using different methods and at the end of the morning we walked her adorable dogs together when we would continue informally before having lunch together. Believe me Chantal has a lot of patience as I made repeated mistakes but she never criticised me just explained where I was going wrong, we laughed a lot and talked about a lot of things, there was also homework to do so my studying continued in the afternoon . One afternoon we went to the forest of Compiègne to the site of the armistice between the Allies and Germany which ended World War One and another day we went to Senlis and Chantilly, we even managed some Christmas shopping. I would love to go back and cannot recommend Chantal highly enough and I can honestly say, don’t be nervous just do it! 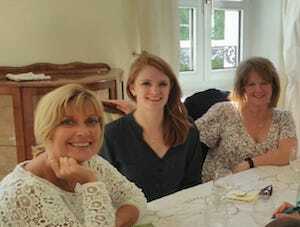 “My week with Chantal in Picardie was my third experience in a ‘home-stay’ in France. Mouy is very convenient: close to the Mouy-Bury SNCF, only 45 minute drive from CDG, a nice walk to the local Intermarché. My car sat unmoved for five days. 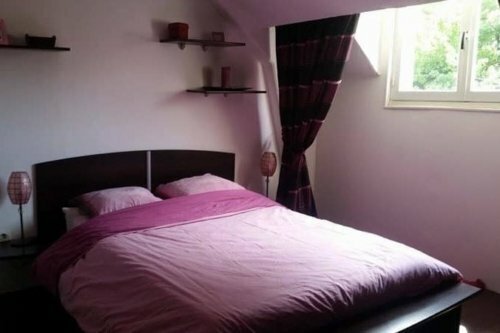 Her student apartment is lovely, modern, comfortable, private and well equipped. Her home and property are both attractive and impressive. Chantal is clearly an experienced and effective teacher; I had a very constructive educational experience. Finally, Chantal and her family are extremely welcoming and generous. It must be difficult for them to welcome new people into their home every week but they do it with comfort and grace. I felt like a guest, not a customer. Chantal also made a great effort to ensure I saw the primary historical sites in the area: le Château de Chantilly, le Château de Pierrefond, la Cathédrale Notre-Dame de Senlis, le wagon de l’Armistice à Compiègne. I enjoyed my two week stay with Chantal very much. The combination of a superb location, a charming hostess, and excellent accommodation is a winning formula sure to satisfy even the most fastidious ‘immersionista’ . Chantal’s relaxed and flexible approach to teaching made it a joy to be learning French rather than the hard slog that it can sometimes be. Her technique of spending part of the lesson time in the outdoors walking the dogs is sheer genius. One gets to practice speaking in a conversational manner under the guidance of an excellent tutor while at the same time burning off some of those excess calories consumed as a result of the deliciousness of the meals prepared by her! 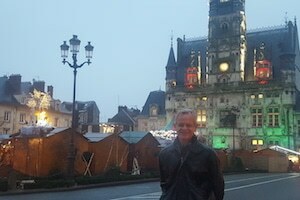 Excursions to Amiens, Paris, Gerberoy and the Château de Chantilly were highlights of my stay and it was fantastic to have a local as a guide. The bungalow in the garden was very spacious and comfortable with all mod cons. I appreciated very much having my own space where I could retreat and relax in privacy after a tiring day. I could have easily remained happily ensconced there for a much longer period. I really can give no higher recommendation than to say that I’m hoping to return to Mouy and chez Chantal at the earliest possible opportunity. À la prochaine fois Chantal. My husband’s first question: would you do it again? My answer: in a heartbeat! 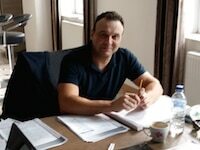 I have just completed a two week French immersion course with Chantal, as an “advanced beginner”. It was everything I’d hoped for and more. Mouy is a small, charming village and Chantal’s home is less than a 5 minute walk to the town center. 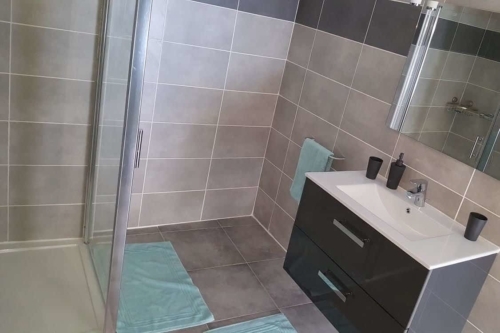 The student apartment is spacious with private bath and a small kitchen. Chantal was able to quickly assess my knowledge level and design a course of study just for me. After le petit dejeuner, the day began with about 3 hours of lessons. Non-obligatory homework was assigned, but to take full advantage of immersion, I approached it as an opportunity to enhance the lessons. Initially, I was intimidated as it was clear that Chantal and her family would speak to me at the normal French pace: fast! I often felt like a deer in headlights, but by the end of the 2 weeks, I was understanding much, much more! Chantal is an amazing French teacher and taught me so much in the short time we had. My French has improved so much since seeing her. Her lessons are nothing like school and are really fun. She cooks amazing meals everyday and the bungalow we stayed in was really nice and the bed was so comfortable. Her 2 dogs are such fun and staying there showed my Mum what having dogs could be like and now my family are planning to get a puppy! There was also a lovely pool to swim in. It was more of a holiday than an education trip and I learnt so much more with Chantal than I would have done in school. I was keen to immerse my 13 year old daughter in a week of intensive French lessons, in France, but knew that a normal classroom would not suit her. How lucky we were to find Chantal! Chantal is the perfect hostess and could not have been more charming, warm and welcoming. Lola and I stayed in the bungalow which is extremely comfortable and ate breakfast and lunch with Chantal and her (equally charming) husband and daughter. Chantal seems to excel at everything she does! Not only is she an excellent French teacher, but also an excellent cook – seeming to effortlessly produce delicious meals in between lessons. 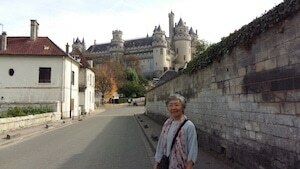 She also found time to drive us to the station for our trips in to Paris and accompanied us on very enjoyable and interesting visits to the Chateau de Chantilly and to the beautiful little town of Senlis. I was so impressed with Chantal’s creative methods of teaching French. If Lola’s energy levels were flagging, Chantal would take her in to the kitchen and cook with her and I also joined them for a game of Monopoly (in French, of course!) on our last day. Of course, the other highlight of Lola’s stay was being around Chantal’s 2 beautiful dogs. 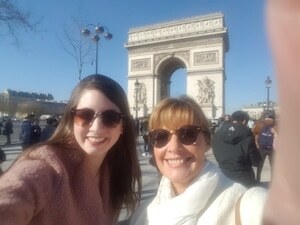 I returned home with a very happy, French-enriched daughter, and will not hesitate to recommend Chantal to anybody, whatever their age, who wishes to learn French in such an enjoyable way. Thanks once again, Chantal, for a really wonderful week! 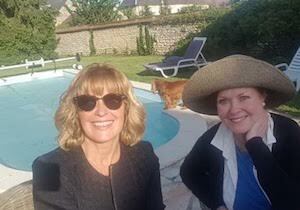 I’ve just spent one wonderful week with Chantal in her lovely home in Mouy. I’m Australian, currently living in Switzerland. I studied French at school but that was 25 years ago! I love the French language and have something of a ‘crush’ on the country and culture. As a result, I decided to use my annual leave to spend a week studying French. I was a little nervous on the day of my arrival, traveling alone to live with a French family I hadn’t met before. My anxiety evaporated the moment I met Chantal. She picked me up from the train station and instantly put me at ease. She is warm and friendly, enthusiastic, interesting and interested. She’s simply one of those people with a warm personality and a sparkle in her eye, who puts others at ease. Her formal lessons were a mix of grammar, listening, reading and talking, all using real life materials including songs and you-tube clips, that she seamlessly adapted as the days went by to match my experiences and interests. The best learning experience, however, was simply spending time with Chantal and her family, listening to their daily conversations, joining in when I could. We had breakfast and lunch each day, and indeed a number of dinners together. Chantal is an excellent cook. Meals were causal and friendly ‘sans tralala’, yet somehow still French ‘chic.’ There was also plenty of time for me to relax in my own little apartment, to do my homework, watch French TV and read. I feel a bit lazy for reading in English and not spending every moment of time immersed in French, but it was a holiday week too! 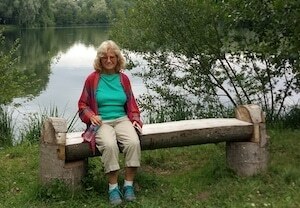 Twice a day, Chantal and I walked her beautiful dogs in the fields or forest, and we chatted in French. We talked about everything from French politics, history, culture and films to our families and friends, to ‘modern love’ and romance, even internet dating! I felt like I was chatting to a friend or sister. Chantal is the type of person you just want to be friends with. My only frustration was that I felt I was stumbling in French rather than talking. I am impatient to improve. Chantal was always patient and encouraging. A week isn’t a long time but I feel I did improve a little, and Chantal gave me ideas and exercises to continue practicing back home. 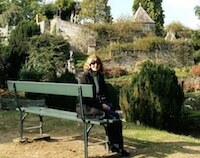 I will stay in touch with Chantal and would recommend her immersion stays and taste of ‘la vie francaise’ to anyone. I just wanted to write and give you some feedback from my AMAZING week with Chantal in Picardie last week. I think it’s always nice for you to know about the teachers you recommend and you should most definitely be recommending Chantal to everyone!!! I truly had one of the most special experiences of my life. Chantal and Marco made me feel instantly at home and as if I were one of their family. I met their youngest daughter, Eliane, as well as Chantal’s lovely mother Lilliane and her companion Jean-Pierre. I absolutely loved their two dogs Jazz and Grignotte plus Titi the cat. Our lessons were interesting as well as challenging for me. My brain was SMOKING by the end of the day!! But I really felt that my French was improving day-by-day and Chantal and I were instant friends. We talked about everything together during my week on our dog walks, shopping trips, coffee with her friends and even during a French dinner party!!! THAT was a real test of my abilities to deal in French and I so enjoyed meeting lovely local French women. Everyone was just so kind to me and patient with my French. I also discovered that Picardie is a fascinating region! 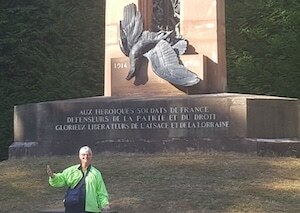 I love History, especially military history and so we visited the forest of Compiègne to see the wagon-lit where Maréchal Foch signed the Armistice in 1918 and again where Hitler signed his own treaty with the French in 1940. 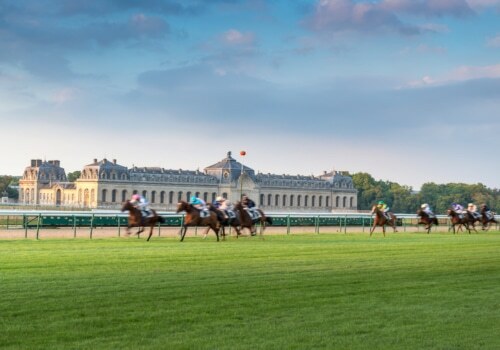 We went to Chantilly, Senlis and Pierrefond as well so we were busy and had a GREAT time together! We really made the most of every single day and I could never have imagined how much French I could have learned in the space of one week. Chantal is a gifted teacher and she explained some of the more complex grammar rules to me clearly and in a manner which made sense. We rehearsed vocabulary words as well. I simply adored every single minute of my stay with her and was so incredibly sad to leave. We shall stay in contact together and I hope she and Marco will one day come to visit me in South Carolina. Yesterday, I was at my Alliance Française conversation group and one lady, who teaches French here in Charleston and is a native of France, told me that I spoke very good French and with a good accent!! I could have DIED of pride. All thanks to Chantal! I would like to say how much I enjoyed my stay with you and your family in Mouy a month ago. I had a horrible experience in Semur en Auxois last year and was quite apprehensive about this immersion. My fears were totally unfounded and I couldn’t have enjoyed my stay with you more!! I wish I could have stayed for a month!!! I found my speaking confidence improved a bit and I really enjoyed your relaxed method of trying to change my bad habits!! I would be happy for you to give my email address to anyone who wants to have more detail on what to expect — if you need to. I hope to come back to France next year and stay with you again. 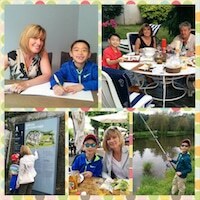 This July, my husband, my son and I stayed at Chantal’s beautiful home in a peaceful French village for a week. We had an incredibly fun time learning French, enjoying good food, visiting beautiful castles, and soaking up the French culture. My 9-year-old son loved his 3-hour French lesson with Chantal every morning. They talked, played games, completed worksheets, watched videos, as well as read and wrote passages in French. My son got a lot of practice speaking French and has made tremendous improvements in his conversational French. 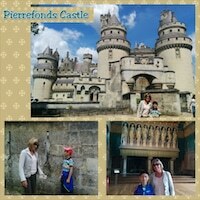 In the afternoons, Chantal took us to visit gorgeous castles such as the Pierrefonds Castle and Chantilly Castle. She was a fabulous guide and our son learned many interesting facts about medieval times from her. We were so happy to see our son and Chantal conversing solely in French throughout the castle visits. Chantal was very kind to take our son to watch the newly released Ice Age movie in the cinema and Marco took Nicholas fishing at a peaceful lake near their home on our last day. Chantal was an amazing and talented cook! She cooked us delicious meals such as baked cod, barbeque lamb chops, homemade quiche, orange duck, roasted chicken, and many more. All meals were prepared with the freshest ingredients and we truly enjoyed the time we spent together at the breakfast or dinner table with Chantal and Marco. We had a fun and memorable week at Chantal’s place. Hope we can do it again real soon. Merci beaucoup Chantal et Marco! I was a true French language beginner not having had any formal language training since taking Spanish 3 in 1964! My wife and I love to travel throughout France, so I decided to learn some French before our May 2016 visit. Not knowing what to expect, I enrolled in an immersion French class with Chantal. I can’t begin to tell you how pleased I was to have Chantal as “mon professeur.” She quickly recognized that I was a “beginner” and structured her lessons accordingly. She was very patient with me as I tried to speak more French, and by the week’s end I felt that I had improved significantly. Chantal did her job exceedingly well for during my two weeks in France after the lessons, I was was very comfortable conversing in French and making myself understood. Chantal and Marco have a beautiful home in Mouy. I was immediately made to feel “right at home”………we chatted, I played with the dogs, drank some wine and just relaxed. Chantal is an exceptional cook and she prepared gourmet quality meals for me each evening. She is very thoughtful, too………she cooked my favorite breakfast and took me to Compiegne one afternoon. While I was in Mouy it rained every day. Chantal, though, filled every day with sunshine, laughter and good conversation. Merci beaucoup Chantal! Chantal et famille m’ont accueilli dans leur maison pendant mes deux semaines de séjour d’immersion à Mouy. La cuisine de Chantal était excellent et j’avais hâte de prendre le petit déjeuner et le dîner tous les jours, en particulier le vin et le fromage. Après les cours du matin, nous allions passer plus de temps ensemble le reste de la journée pour améliorer mes compétences de conversation, aller visiter le château de Chantilly et faire des voyages quotidiens vers les magasins locaux. J’ai eu la maison pour moi tout seul et je restais souvent tard en regardant des films. Ils ont même trouvé un vélo pour utiliser pendant mon séjour pour monter les montagnes de Mouy. Je vous remercie beaucoup et j’espère que nous pourrons rester en contact ! 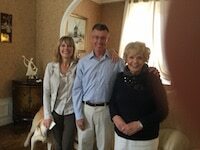 I’ve just returned from a delightful week spent at the lovely home of Chantal and Marco, who made me very much at home, having spoken (barely) a word of English throughout my stay. Chantal is an excellent tutor, tailoring her tuition to your own needs, and making the whole experience interesting and fun. It is obvious she really loves people, and helping them to learn. 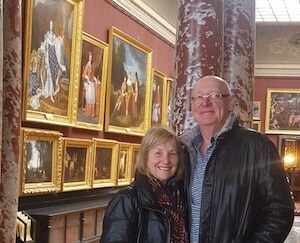 As well as taking me to and from the airport, we had several outings – to the chateau of Chantilly, where Chantal’s knowledge was such a bonus; the lovely medieval town of Senlis and its art gallery; a local market, and a garden centre. I watched French films (with French subtitles) and talked about them, and we enjoyed a few games of Scrabble with Chantal’s mother . Chantal’s French cuisine was something I looked forward to each evening. No matter what your level of French, you will learn so much ! […]The house is very comfortable and has every facility. Best of all, Chantal and Marco came in and provided breakfast and dinner every day. Chantal is an excellent cook and the food was first class throughout (and the wine!). Chantal is obviously a very good teacher. She managed to adapt to my situation very well and was flexible and attentive – I think I have made a vast improvement. to be able to converse easily on our visits to local places of interest and at meal times gave me real added confidence. The only problem I had was my choice of location and transport. […] The car journey was terrible […] I should have flown […] especially since I have not used the car once during my stay! Mouy is OK but I would have preferred to have been somewhere I could have been able to take walks from. Donc, j’ai passé une semaine très agréable avec Chantal et Marco. Jai travailé dur et j’ai vraiment apprecié leur enseignement, l’hospitalité et de l’amitié. Merci pour tout ! “I came to stay with Chantal for a week with my family. We all arrived on the first day not feeling very confident and my spoken French was a bit ropey. 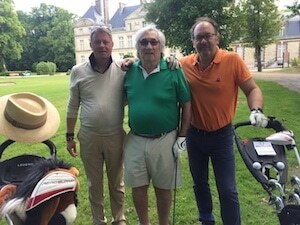 Throughout the week my brother Olivier and I took lessons with Chantal in the morning before spending the afternoon with our parents. The lessons were really enjoyable and useful; they were very relaxed and there was a completely different atmosphere from any lesson I’d ever had. The time (3 hours a lesson) passed really quickly and I learnt loads. As well as completing worksheets we practiced French speaking, watched French reports and played games, all the while improving and gaining more confidence with our speaking. 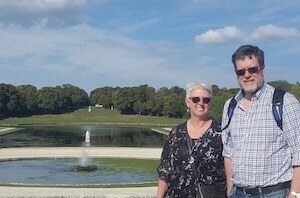 We went out twice with Chantal, once for the afternoon to the beautiful local town and chateau of Chantilly and a second time we made the trip to Versailles to spend a lovely day there. When it came to the time to leave we did so sad that the great week was ending but with far more confidence and vastly improved French. My experience with Chantal was amazing! The accommodations are great, the food is perfect and studies are intense! I just finished my first year of private lessons and self study in the states and felt I wanted to try out an immersion class. I was super nervous about the trip – my experience, not knowing Chantal and going alone. All my nervousness was laid to rest when I arrive at the train station and was greeted by Chantal! Chantal is charming, accommodating and a stickler for practice. The week was definitely tough, but thankfully tough doesn’t translate to not fun. Apart from class time, we had plenty of conversations (in French), walks with her dogs (Not necessary but I love dogs and walking) and some site seeing to the local landmarks. I highly recommend taking an immersion class and equally recommend a week with Chantal! If you have further questions about the experience, you can always contact me Doug Nichols at <dougxn dot me dot com>. 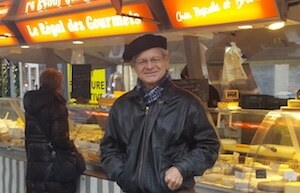 I have just returned from France and spent time with Chantal and Marco to learn French – and I was a complete beginner! Chantal is an amazing teacher and has given me a fantastic start in learning the language from the grammar, pronunciation and everyday use of the language. I feel I have learnt so much, certainly more than I could have from other structured class room type facilities in the time that I had. The food Chantal cooked was better than I cook myself in my own home! I feel I was really treated as part of the family and not just as a student or a house guest. I got to see a lot of the local area which is just magical and took the weekends to enjoy Paris which was a very easy and quick train ride away – about 35min right into the center of Paris. Chantal certainly helped me not only learn the language, but also a lot about the culture and everyday living in France. I thoroughly recommend Chantal, the experience she has to give to her students and to be welcomed into her home is beyond reproach – you really feel at home while learning the language. I plan to go back for sure! 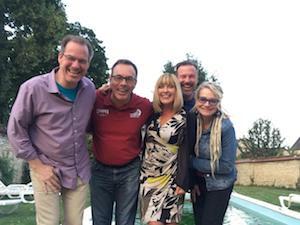 Thank you so much Chantal and Marco for a truly memorable time in France. The week of immersion that I spent with Chantal was extremely enjoyable and beneficial. Before my arrival Chantal had pro-actively sought to know my level of French, my interests (subjects, types of books), my goals for the week, and how I would like to have the lessons structured for the week. Based on this information Chantal planned our week of language instruction and cultural activities. This was not a rigid program however, but a flexible one which evolved during the week. I found that my week with Chantal and her family was not only a valuable language learning experience but also a cultural experience. This is, I suppose, the nature of immersion. Chantal enhanced my experience with several excursions during the week. Chantal’s house in the village of Mouy is well situated having a variety of destinations close by. Chantal is also a very good cuisinière (cook) providing delicious and varied meals throughout the week. I would recommend without hesitation a French immersion experience with Chantal to all students of French language and culture. It is difficult to concisely summarise my two weeks in Mouy. But I will try to convey to you, “potentiels aprenants”, my truly rewarding and enjoyable experience with Chantal and Marco. First let me explain that I am well qualified to provide meaningful advise to all who are considering an immersion experience in France. Although I was not gifted with language learning abilities, I embarked on a journey to become conversant in French, Italian and Spanish. My classroom learning and private tutors provided a intermediate base upon which I could attempt “immersion”. I have now completed language/cultural immersions totalling more than six months. My experience in Mouy was the best. The primary reason was “grâce à Chantal”. She is gifted in being a “vrai” teacher. While many know the science of teaching, Chantal has the unique skills (listening, comprehending and instructing with sensitivity to the students strengths and weaknesses) that transform the hours together into periods of productive and enjoyable learning. We talked, we listened, we discussed, we debated, and we became friends. Most importantly, I made a enormous step towards being conversant in French. 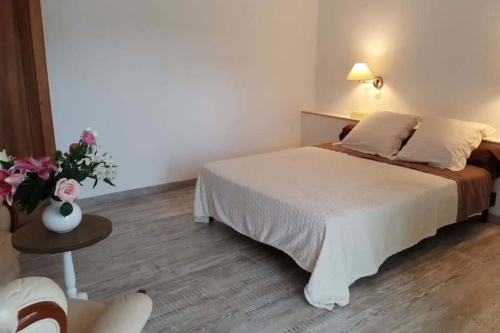 The accommodations in Mouy were four star and The Paauwen Family will add another star when their new “résidence luxueuse aux étudiants” is completed. The meals were varied, interesting and delicious. Mouy is very small but it was perfect for me. I ventured down to the local “café” where I met “les habitants” and developed a conversational relationship. While Mouy is “petite” it is very close to Paris. In fact, I took the weekend off and traveled to Strasbourg in only a few hours. 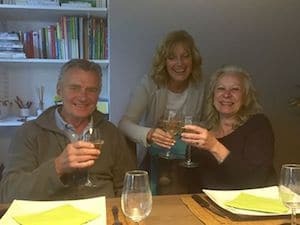 If you are interested in a immersion experience to improve your French, learn French customs and experience life as “les gens du coin”, my advice: sign up with Chantal, Marco and Mouy. My week long stay with Chantal was totally enjoyable. I was made very welcome by her and Marco and by the two dogs and one cat who all provided excellent company! My room was warm and comfortable, the food excellent and it was possible to feel entirely at home and not remotely intrusive. The week was intensive but entirely manageable with one to one teaching in the morning, covering significant grammar points as well as listening exercises; the three hours always flew by. The afternoons were given over to dog walking, visits to local places of interest and time for me to go over some exercises to consolidate learning. Chantal was adept at finding entertaining films for me to watch. These had French subtitles which helped the comprehension enormously. In addition I watched a lot of French television and did find as the week progressed it was becoming clearer. Of course we also talked a huge amount and I really felt that by the end of the week we were good friends. We certainly found lots to laugh about not least at the judo class I went to with her. As the novel I was reading was also in French, I did pass the entire week in that language with rarely a word of English heard or spoken. It was gratifying to discover that this was possible even though the errors were still very much in evidence! I finished the week really feeling that I’d have liked to do one or two more and am certainly considering returning during the coming year to build on what I’ve learned. My stay with Chantal and Marcus exceeded my expectations. They are both very nice, very friendly, and easy to be around. They sincerely welcomed me into their home. The home is very comfortable, very clean, with a nice mix of old and modern. My room was big and very cozy and I was very comfortable in the big bed. I had some apprehension about sharing a bathroom (note: this is an option, you can also have the all house to yourself) but it was not a problem as we were on different schedules. It was never a problem. In the mornings, I had the bathroom all to myself. Our French lessons were fun. Chantal has worked out a good program with a mix of grammar, speaking and listening. She knows her material very well and is very positive and upbeat in presenting it. It couldn’t be a more pleasant learning experience. I particularly liked the French music and movies that she introduced me to. The learning continued after our lesson as we spoke French all day. We ate our meals together and watched TV in the evenings. 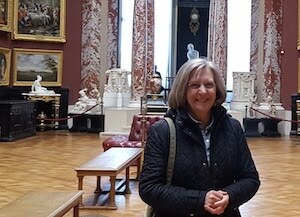 She took me on 3 outing to the cathedral and art gallery in Beauvais, the Chateau in Chantilly and the Senlis market, cathedral and museum. These were all very special places and ones I would not have known about otherwise. To add to all these wonderful experiences, Chantal is a fabulous cook. The meals were excellent! Better than any restaurant meal, I have had in Paris. 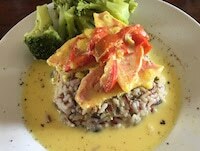 The variety of her menu, the freshness of all her ingredients, and the visual appeal, all made for some incredible meals. I don’t know if she should advertise this as she might be over run with clients. I appreciated that she asked me for any dietary restrictions and supplied alternatives. For me it is no caffeine. She made wonderful café à la crème with decaf everyday. Seeing a country while being hosted by a local is the dream of most travellers. We, travellers, realize that one can never know a country without getting to know the locals. 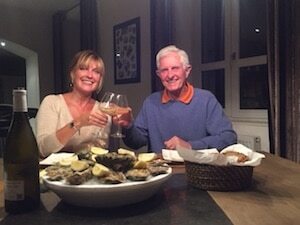 I have never had a better experience in France and I am sorry I did not book more than 1 week with Chantal. My grammar, vocabulary, understanding and stumbling spoken French have improved this week and would improve markedly more if I could stay on. I feel motivated to continue learning and I hope to return next Fall for a longer stay. Chantal’s is a wonderful spot for learning French. Because the village is very small and doesn’t offer much, a partner not participating in the French program might want to have a car to explore the surrounding area. In the summer there is a pool. There are 2 wonderful friendly dogs and a one-eyed cat who added greatly to my enjoyment of the week. As you can tell, I had a great time and would highly recommended to anyone who wants to have a French immersion experience in a calm, friendly, rural setting. Just one more special thanks, Chantal picked me up at Charles De Gaulle airport. After a sleepless night on a plane, it was greatly appreciated. The meals she provided were typically home-style French meals, and I felt welcome to join the family meals to continue listening and practicing French. In the afternoons, we visited Lola’s towns, markets, and cultural and historical sites. Merci beaucoup pour les leçons et la camaraderie cette semaine. The course that Chantal provides is very comprehensive. It gave me a much greater understanding of the pronunciation used in every day French. The material she uses is second to none. It gave me a lot of information at my fingertips. J’ai appris beaucoup plus cette semaine. Chantal is an excellent and understanding teacher. The week I spent with Chantal (+Marco) was really unforgettable. Chantal was very patient with me and my beginner French. She made sure to help me learn the essentials for getting around France, where I will be traveling for the next 3 weeks. Her home is clean and cosy, and every meal was excellent. 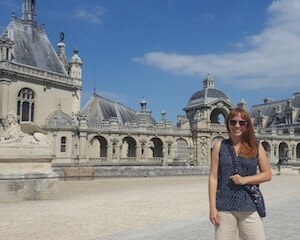 I really enjoyed our excursion to Chantilly and day trip to Paris. I always felt at ease asking questions, and am very grateful that Chantal opened her life and home to me so generously! Chantal a cuisiné formidable. Tous les repas ont été traditionnel, complet avec le vin et le pain. Maintenant je suis plus confiante parler le français. Je voudrais retourner encore pour avoir plus de cours – pour moi, une semaine n’est pas suffisant ! I have spent 3 weeks with Chantal and her family in her beautiful house. I came to study at the “Faculté d’Amiens” in September therefore I needed to get more confidence and to focus on speaking and listening skills. She knew exactly which areas of the language I needed to improve and she always encouraged me with speaking! Le programme qu’elle m’a proposé était très intéressant, et bien adapté pour moi. C’était des vacances très agréables et studieuses aussi. Sa famille est très gentille et j’ai pu parler beaucoup. J’ai partagé sa vie pendant 3 semaines et ça a diminué un peu ma peur pour la rentrée. Et j’ai vu beaucoup des belles choses à Paris et dans sa région. Merci encore Chantal. I decided to learn to speak and understand French well enough to enjoy holidays. We often come to France with my friend but it’s always a problem to speak and to understand French people when they are in a group. Chantal gave me useful notes and tips to understand the real French language. We practiced a lot with songs (which was very challenging for me), newspaper, and television programs. It was fun and Chantal is a very intuitive teacher with a big experience and enthusiasm. She is a very good cook, and I enjoyed cooking with her! The wine and the French cheese were gorgeous! I recommend this course because, on top of the time that you spend in lessons with Chantal, you will have to speak French with her and her family all day long. It has been a really exciting experience. This summer, my wife and I, spent one week with Chantal to improve our French. Almost twenty years ago we had lived in France for three years and had enjoyed learning the French language and the ‘joie de vivre en France’. Back in the Netherlands we joined a local course to keep up and improve our French. During this course, we read and discussed quite a few French books, but following French television, films and ‘chansons’ remains a challenge for us. Therefore we decided this year to follow a one week immersion course in France with Chantal. 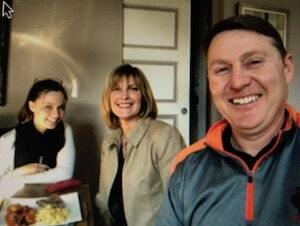 The immersion week gave us ample opportunity to speak French with Chantal and her family. Speaking and hearing French for one week was really a very useful way for us to feel at ease with the spoken language. Each morning we had structured lessons with Chantal. She taught us in a very relaxed and thorough way different aspects of the language as well as made us listen to spoken French on various topics. We watched together short video clips and saw a comedy movie. After this week we definitely feel that we have improved our understanding of the spoken French language. Living for one week with a French family was a great experience. Chantal and her family are very friendly persons. 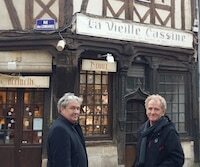 We enjoyed each other’s company and the great French ‘cuisine’. Chantal is a great cook. 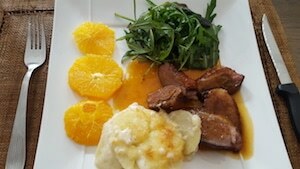 At our request, she prepared traditional French dishes. Conversations with Chantal and her family during the meals were always interesting and contributed greatly to our understanding of the spoken French. We also made interesting trips in the surroundings with Chantal, who knows the region very well. C’était une semaine très agréable pour nous. Une semaine chez Chantal et sa famille était une expérience formidable d’améliorer notre connaissance de la langue française. Merci beaucoup, Chantal!